DECEMBER 1, 2007 – JANUARY 12, 2008. 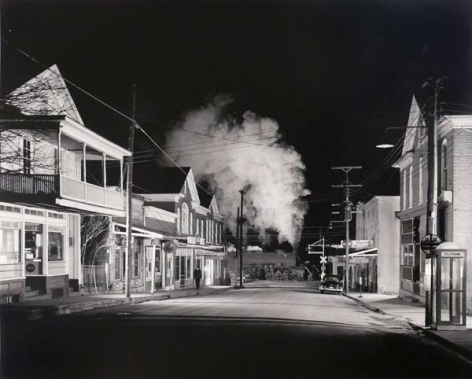 O. Winston Link was born on December 16, 1914, in Brooklyn, New York, and died in 2001. 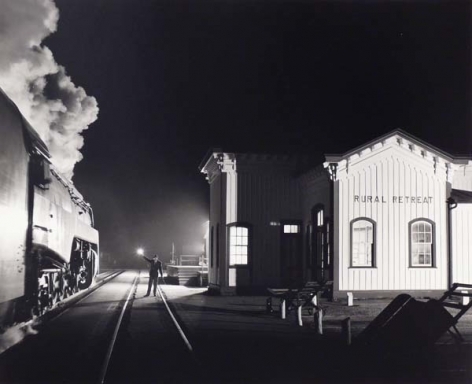 From an early age his two great passions were photography and trains, and when a chance commercial assignment took him to Staunton, Virginia, a town only a few miles from the Norfolk and Western railroad line, his artistic and life path was set. 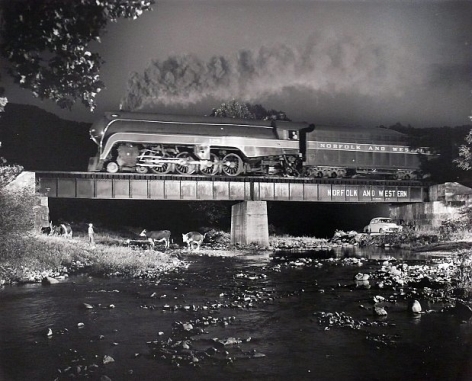 It was 1955 and the Norfolk and Western (the N&W) was the last large steam-powered railroad in America. 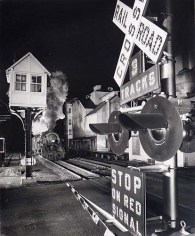 Within weeks of his first visit, Link had secured permission to access the tracks from R. H. Smith, president of the railroad company. 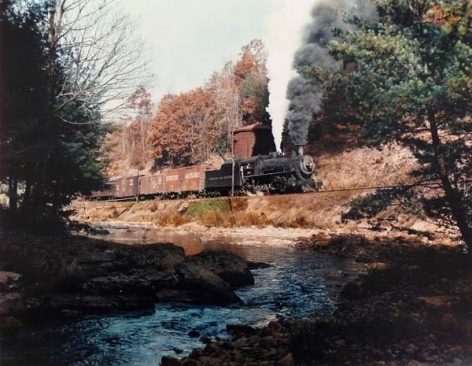 Over the next five years, Link made over twenty trips to Virginia, West Virginia, Maryland and North Carolina, producing over 2,400 images of the line. 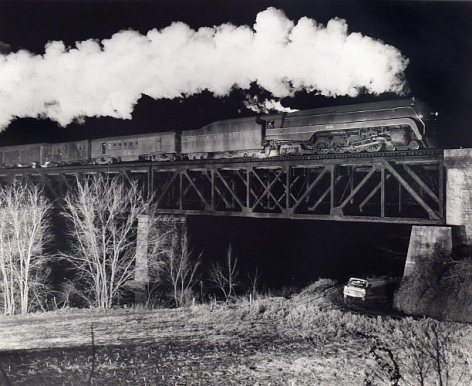 Most of the images were produced on 4 x 5 film with a Graphic View Camera. 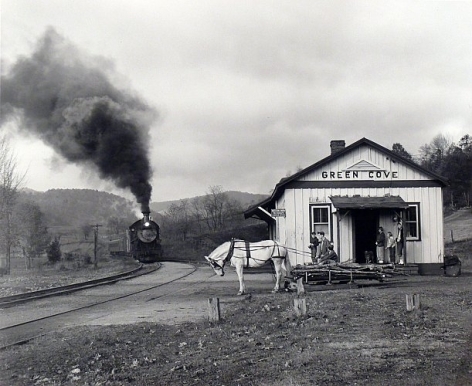 Far from simply viewing the trains as great machines or connected to the tradition of transcontinental transportation, Link brought his own personal vision to the work - one that combined the trains, the landscape, the stations and whistle-stops, and the people who worked on them and lived near them, into a photo-Rockwellian whole. 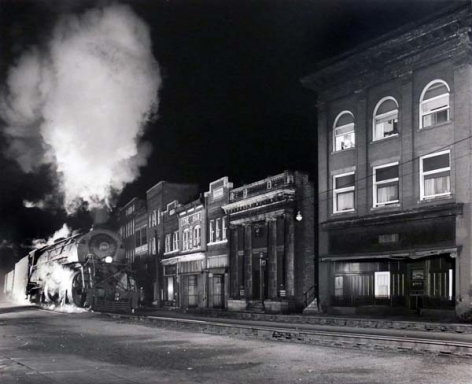 While there was clearly a documentary aspect to the work, most of Link's pictures were as carefully constructed and planned as a feature film. 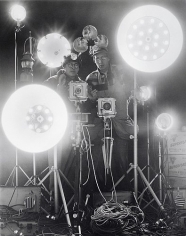 Link posed and directed his subjects, used all manner of photographic trickery, and created elaborate lighting set-ups often using as many as a dozen lighting banks each containing as many as 18 individual flashbulbs that needed to be replaced after every shot. "You can't move the sun, and you can't move the tracks, so you have to do something else to light the engines." he said. 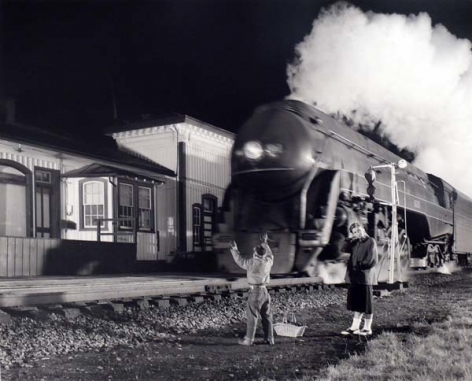 After Link became friends with many of the engineers and drivers, a train would often stop in mid-journey, back up, and repeat a segment of its route so that he could get the shot he wanted. 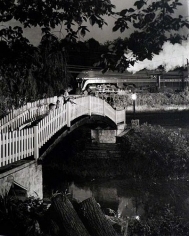 Link also photographed by day and in color, examples of which are included in the exhibition, but his reasons for shooting at night were simple. For one, it was more romantic and dramatic. 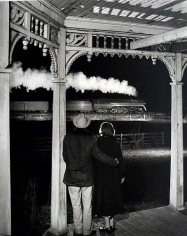 For Link the trains were comparable to Garbo and Dietrich at their most glamorous. 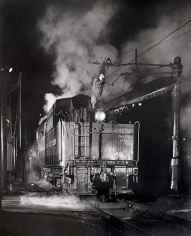 Secondly, steam against a night sky photographed white. Against a day sky it came out a dirty grey. 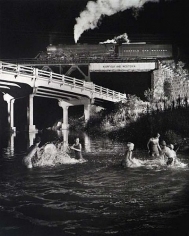 However, starting in 1983, Link's photographs began to be exhibited as works of art. 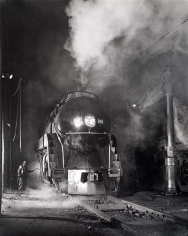 Several museums in England and the United States organized exhibitions of the N&W photos, and a book "Steam, Steel, and Stars" followed in 1987. 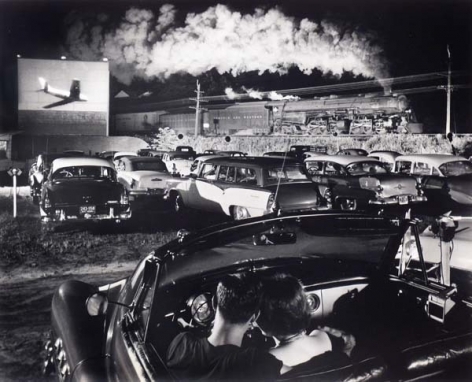 At first Link's photographs were appreciated for their combination of nostalgia, technical virtuosity, and – partly due to Link's famously cranky character and disposition - almost outsider artist's vision. 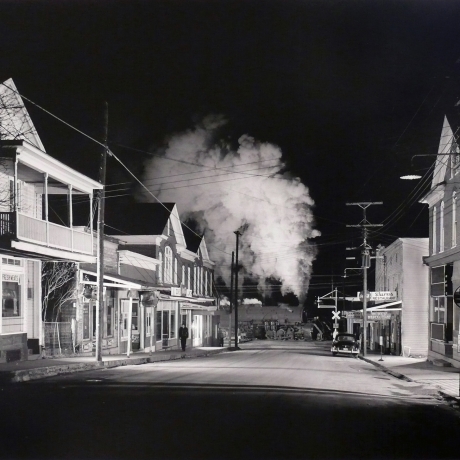 But as photography has moved on, Link's work is increasingly seen and appreciated for the degree to which he controlled, planned, and constructed each image, prefiguring such well known contemporary artists as Gregory Crewdson and Jeff Wall, both of whom willingly acknowledge their interest in and appreciation of Link's work. While Link's last years were marred by the chicanery of his wife Conchita – who was jailed for several years for virtually imprisoning her husband and stealing hundreds of his prints – they were not without some satisfaction for him. 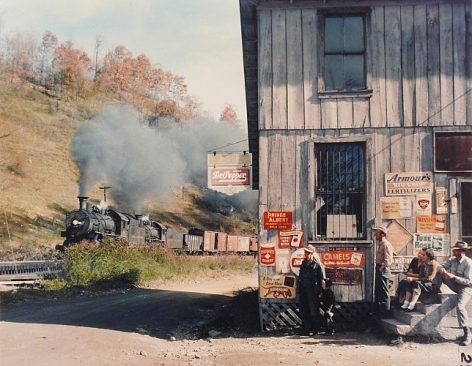 In 2000, Link agreed to the creation of an O. Winston Link Museum to be located in Roanoke, Virginia. 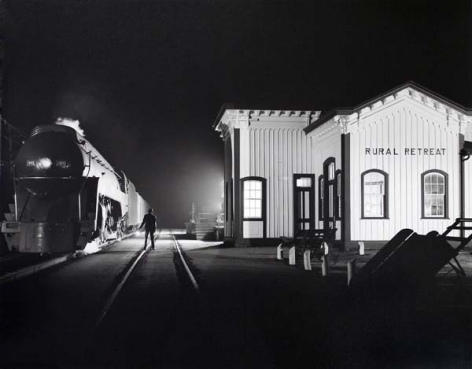 With Link's enthusiastic involvement, the station was restored and refurbished by the famous industrial designer, Raymond Loewy and the museum opened in 2004.